Ships today if you order in the next 4 hours 58 minutes. 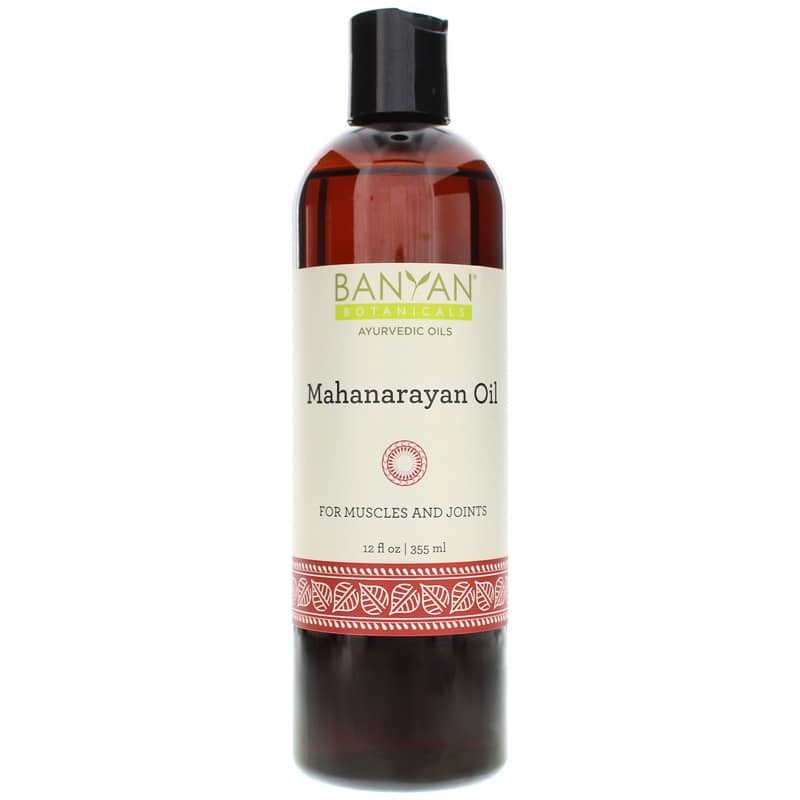 Mahanarayan Oil from Banyan Botanicals is based on an ancient Ayurvedic recipe that delivers powerful muscle and joint targeting herbs in a base of certified organic sesame oil. 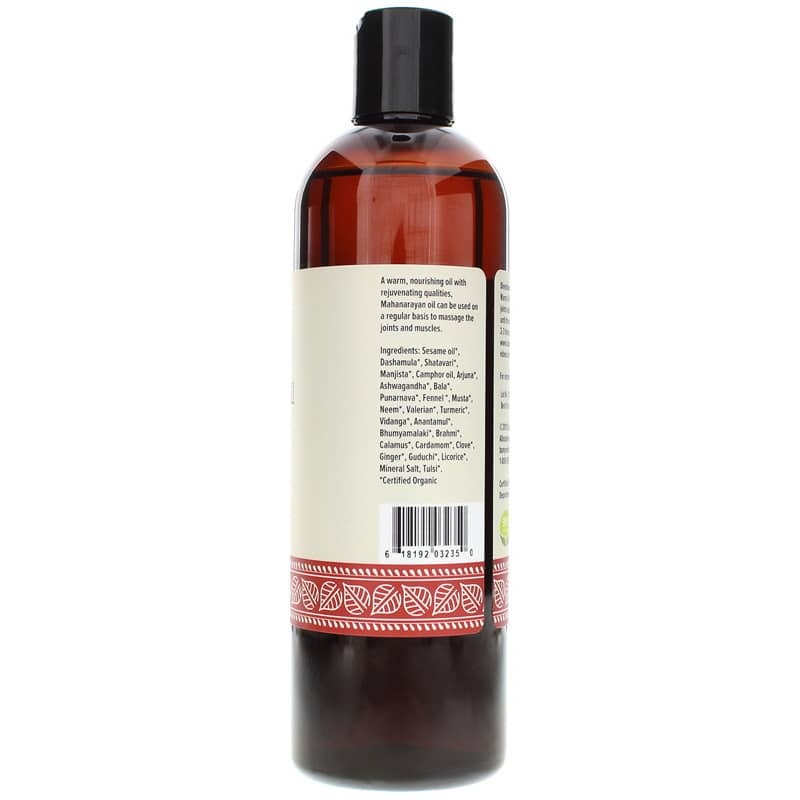 A nourishing and strengthening oil with rejuvenating qualities, it is used by gently massaging into sore muscles and tendons to bring warmth to the area. The synergistic blend of herbs supports the rejuvenation of joints. 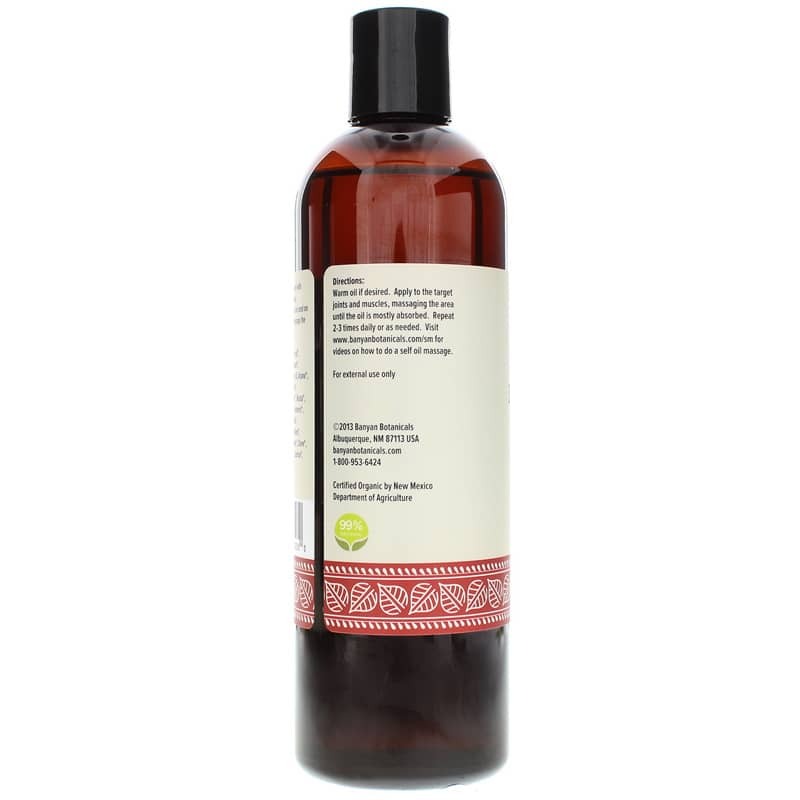 In Ayurvedic terms, Mahanarayan Oil is particularly good for supporting an active lifestyle, for those experiencing high vata, and promoting the natural rejuvenation process. The oil can be applied locally to areas where there is physical discomfort. It may also be diluted with a base oil and used in deep-tissue massage. Sesame oil(1), Dashamula(1), Shatavari (Asparagus racemosus)(1), Camphor oil, Manjistha (Rubia cordifolia)(1), Arjuna (Terminalia arjuna)(1), Ashwagandha (Withania somnifera)(1), Bala (Sida cordifolia)(1), Punarnava (Boerhaavia diffusa)(1), Fennel (Foeniculum vulgare)(1), Musta (Cyperus rotundus)(1), Neem (Azadirachta indica)(1), Valerian (Valeriana officinalis)(1), Turmeric (Curcuma longa)(1), Vidanga (Embelia ribes)(1), Anantamul (Hemidesmus indicus)(1), Bhumyamalaki (Phyllanthus amarus)(1), Brahmi/Gotu Kola (Centella asiatica)(1), Calamus (Acorus calamus)(1), Cardamom (Elettaria cardamomum)(1), Clove (Caryophyllus aromaticus)(1), Ginger (Zingiber officinale)(1), Guduchi (Tinospora cordifolia)(1), Licorice (Glycyrrhiza glabra)(1), Mineral Salt, Tulsi (Ocimum sanctum)(1). Warm oil if desired. Apply to the target joints and muscles, massaging the area until the oil is mostly absorbed. Repeat 2 to 3 times daily or as needed. I bought this for my kids for occasional post-sports workouts. They are very active and sometimes ache after a rough practice or game. Seems to have helped them (hard to tell with kids - but they stopped complaining about THAT ailment!!!). What convinced me was the test on my friend's neck which was sore, from who knows what. She was AMAZED!!! Ordered her own bottle right away. So I have a bright future for this product in this household!